Just yesterday I wrote about different plans on how to invest my 401k rollover funds. I still haven't ironed out the exact details yet although I've narrowed it down to 2 options. One big part of both choices is to use some amount of the capital for writing put options to generate income/profits now or buying shares at a discount. I've been quite active in the put selling department and on Tuesday I just couldn't help myself and wrote another one. Over the last week or so I've written 6 put options representing over $50k worth of purchases. Yikes! So yeah I'm going to slow my roll a bit until I can get some of these closed for solid profits. This latest put option is on a Dividend Champion with a streak of raises over 1/2 a century long, 54 years to be exact. Even better is that despite that lengthy streak the dividend payout ratios are still relatively low between 30-40% of earnings or free cash flow. That's impressive and really speaks to the growth this company has undergone although the growth isn't necessarily done and dividend growth should remain strong. I really like put options as a way to essentially set a limit order and get paid for it to hit. This works wonderfully if you've done your homework on the company and are comfortable purchasing the shares. The big risk is something unexpected happening that alters your investment thesis, although I'd venture to guess that with many of the blue chip dividend growth companies that doesn't happen that often. That's why I consider put options to be the best of both worlds. So how can this move play out? If the share price remains above $65, the option won't be executed and I'll just keep the premium as profit. The premium return is pretty solid at just under 2% in about 1.5 months time. On an annualized basis it's a very strong 16.71% return. If the share price declines below $65 then I'll be forced to purchase 100 shares at the strike price less the option premium. That works out to an effective purchase price of $63.75 which gives about 7.9% downside protection from where shares were trading, ~$69.20, when the contract was sold. At that purchase price the yield on cost would be 2.20% compared to the current yield of 2.09%. Based on the earnings estimate for the current fiscal year, ending 1/31/17, of $4.00 that would represent a P/E ratio of 15.9x. For the following fiscal year, ending 1/31/18, the average earnings estimate is $4.66 giving my purchase price a 13.7x forward P/E. When I was choosing which option to write I was kind of limited due to wanting to receive the next dividend if the shares are put to me. So that means the expiration date needs to be prior to the ex-div date which is on 1/23/17. I would have preferred the January 2017 puts from a date perspective, but the strikes and discount wasn't quite as attractive as this one. So here we are. One thing I really need to remind myself to do is always check the earnings date. I completely neglected to do that when I sold this put contract and very likely would have waited until after the earnings release this morning to write a put option. No harm no foul though since I'd still be quite happy to buy shares of Lowe's in the low $60's, although I might have been able to get a bigger discount/premium yield. It's been just over a year since I did a full write up on Lowe's, but back then the low $60's represented an attractive price and I'm sticking with that as a target entry price. Yesterday also brought some more action on the options front within my FI Portfolio. I had to do a bit of position maintenance on the call option that I had written on Target Corporation (TGT). They announced what I considered a kind of blah earnings release considering the estimates had been taken way down, yet the share price jumped up around 8% and well above the $74 strike on the call option. So it was necessary to roll it out and up. I also closed another call option with just 2 days left until expiration. What was I thinking? I'll highlight both of these tomorrow. What do you think of Lowe's Companies, Inc. as a long term investment? Do you think the risk/reward is good enough with this put option? Like the Lowe's Trade! I think you will do quite well either way. Regarding LOW I'm definitely happy with either way this works out. Although if it's going to expire I hope to see LOW move back higher relatively quickly so I can close it out for a solid gain and release that cash for other put selling activity. But I'm happy to buy shares below $65. Although I have yet to enter a Lowe's, I really liked their Rona acquisition. There are 3 Rona's within 15 mins of my house, and it's a loved brand in Quebec. Good luck with the option! Of the top of my head I don't think Lowe's has their actual stores in Canada, although I could be wrong. I honestly don't know what my preference is for this option. One on hand I'd love to buy shares at $63.75, but on the other I'd love to cycle through a few put options to generate income and then have a put option execute. Either way though I'll be a happy camper. Great trade JC. I've been sidelined a bit, only selling calls right now. I'm still nervous about a rate cut and this whole Trump thing. I think this was a good put option from a risk/reward. 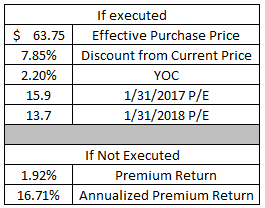 Shares were already priced at a point where I might consider a small starter position, but the put option gives nearly 8% downside protection and over a 16% annualized premium return. That's a solid trade in my opinion. I still don't have many positions in which to sell calls although if some of these puts are triggered in my Rollover IRA then I'll likely turn around and start selling covered calls. 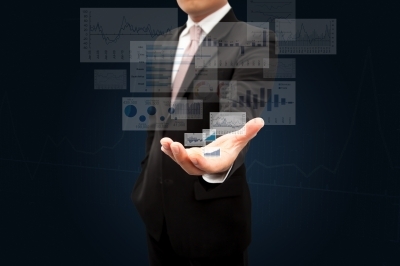 No commissions and no taxes makes it a great strategy for tax advantaged accounts.